I'd love to put a joke here about a kangaroo with one bad knee, but I'm just not that funny. 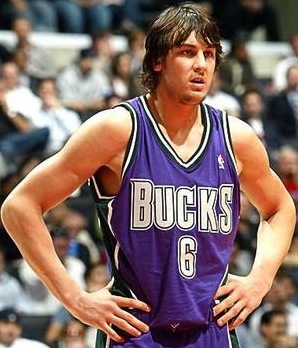 Well the word has come down that Bucks center Andrew Bogut will miss the next 7-to-10 days with a bruised left knee. This hurts owners who have slowly watched him get better as the season went along and were pumped that he had four games on the schedule this week. But he only got through three quarters of one game and if you’re in a weekly lineup league, it leaves a huge hole. For those in daily leagues, you’ll be without for five games minimum and will need a fill-in at the center position – always a tough find. Bogut will miss the remainder of this week and as a best care scenario will only play in one of Milwaukee’s three games next week – not enough to make him worth putting in your lineup. The ultra-silver lining is that if he returns around December 6 he will be ready for the week of December 8-14, when the Bucks play three somewhat defensively challenged teams (Phoenix, Golden State and Indiana). Michael Redd may be back too, which would be a nice bonus (especially if you own Redd too). Of course the first instinct is always to look on the injured player’s team to see who will benefit most from the open spot. Charlie Villanueva should have a boost in value with more shots and minutes, but he can’t play center. If you have a center-eligible forward, slide him over and grab Charlie V.
Luc Richard Mbah a Moute is a secondary option if Villanueva is taken, but he won’t give much more than some rebounds. Milwaukee’s center eligible players in Yahoo! are Jake Voskuhl, Francisco Elson and Dan Gaduric. Next! There probably are not many great options on the waiver wire, so you need to look at quantity over quality. Indiana has four very favourable games, making the underrated (in a fantasy sense) Rasho Nesterovic and Jeff Foster solid options. Both are averaging more than six rebounds and one blocks per game while shooting a high percentage from the floor and suprisingly contributing in assists. New Jersey also has three games on tap and the emerging rookie Brook Lopez is becoming a must add. He could be a great fill in and have a spot in your regular lineup once Bogut returns. We all know the stock of Joel Przybilla is going to fade eventually, but Portland has four potentially high-scoring road games next week. Of course he does not score a lot, but three of the teams on the trip (New York, Washington and Toronto) are among the easiest teams in the league to post great fantasy numbers against. If you are in a daily league and need someone who can play center, this injury may actually give you an opportunity to recognize and snag those underrated fantasy centers that you haven’t been paying much attention to. Netserovic and Foster have both provided top 100 value in nine-category leagues thusfar this season. Nesterovic especially is a guy who should be owned all season long, even if it’s just as a third center. He played well down the stretch with Toronto last season and is a skilled seven-footer. It’s not a fluke. Przybilla has been a beast, shooting better than 80 percent from the floor with 8.3 rebounds and 1.2 blocks per game. If can stay that valuable for just five more games, he’d be a great fill in. And forgive me for saying so, but Erick Dampier is not a bad flier. He’s averaging 7.5 rebounds and 1.2 blocks and shooting 62 percent from the floor. He occassionaly erupts for 15 points and 15 rebounds and if he does so in the next 10 days, you’ll be the beneficiery.